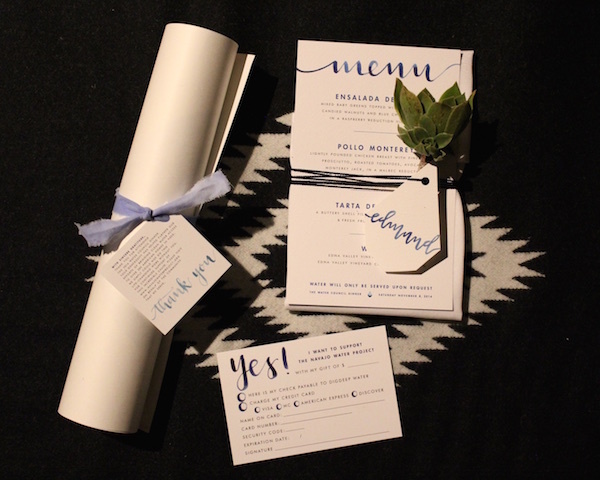 It was such a privilege to design the Water Council Dinner to raise money for DigDeep and their Navajo Water Project. The event was held at the Los Angeles Athletic Club last Saturday and we raised a good chunk of money to help brining clean, running water to homes on the Reservation in New Mexico. I loved getting to design the invitation suite and then carrying the idea through the decor. It ended up being a real family affair to get the pieces ready. We had a family emergency and I was so glad to be home with everyone and then they helped me! My sweet mother sewed the table runners out of a muslin fabric and I dyed them in a dye that Marylouise brought me back from Morocco! I wanted it to mimic the watercolor of the invitation. Then, instead of bouquets of flowers, I chose to pot cacti and succulents because of their low water usage. It must be my southwestern heritage, but I just adore them. Thanks to my cousins and aunt and uncle who helped with that. I also used little slats of wood and brass hinges to make quick table numbers. To add height to the table, I wanted to include brass candle sticks to tie in the gorgeous brass chandeliers, but then we discovered that we couldn't have candles in the venue. I turned them into little succulent holders, which ended up working so nicely. I watercolored all the print pieces, made name cards in the shape of the DigDeep logo and tried to make each guest feel special and important. Soon, DigDeep will be selling those gorgeous Pendelton blankets for their Christmas campaign to raise more money for this project. Follow them, if you're interested and want to be as cozy as I was!! And, if you have an event coming up and you need someone to customize the decor and make it one of a kind, I'm your gal. Contact me at erica@beaheart.com! !